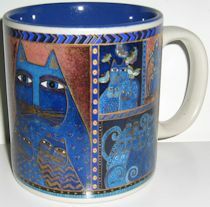 Here is one of Laurel Burch's most popular cat designs - Indigo Cats. This mug is 3 3/4" high x 3 1/2" wide, not including the handle. The mug is dishwasher & microwave safe. Comes in its own decorative box.